Arlene McCarthy lives in Kitchener and cottages in Simcoe County. She paints in watercolour in also in acrylics which she enhances with a variety of acrylic mediums. She favours representational, impressionistic, and abstract styles. She is inspired by the beauty, history and symbolism of doors whether here in the Kitchener/Waterloo area or further away in time and distance in places such as the British Isles, Europe, Mexico and the Carribean. Her recent paintings focus on the dramatic and sometimes frightening weather effects we experience in Southern Ontario, often using bold colours and high contrast to create a sense of mystery and invite viewers to reflect on the effects of weather on people, buildings, natural objects and landscapes. Arlene is a member of Quest Art School and Gallery in Midland, Ontario where she has studied and also participated in art shows. 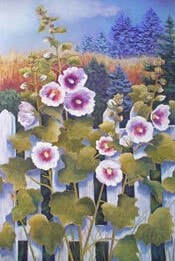 She is currently the Vice-President of the Kitchener-Waterloo Society of Artists.